What Is a Monogram Tote Bag? Gift shopping for your wife can be remarkably time-consuming if you don’t have an innate knack for it. And let’s face, we’re all so busy these days, gift giving can seem like just another item on that never-ending to-do list. The thing is, it’s not just Christmas and her birthday you need to think about either. How about Valentine’s Day? Do you have a gift lined up for your anniversary? Even if you’re not giving impromptu gifts throughout the rest of the year, that’s four occasions to consider right off the bat. Then, there’s the double-edged sword that comes with giving a gift. The longer you’ve been together, the better you know your wife. So far, so good. The thing is, it’s not always easy to find that special something as the years go by. You’ve already bought all her favorites. Also, she buys herself treats every so often. Finding something that she likes and doesn’t already have can seem like hard work. It doesn’t need to be that way, though. Rather than heading out and blindly shopping, why not consider buying online? Instead of going from store to store until something catches your eye, you can browse our site for the perfect gift. We’ll throw you a bone today and suggest a monogram tote bag if you’re stuck for ideas. Now, we can already hear some of you asking what a tote bag is so we’ll clear that up first before showing you how you can make it even more special. What Is a Tote Bag? If you ask most women what they can never have enough of, there are probably two answers. Shoes and bags. But be honest, how much do you really know about bags? Maybe you love them yourself, and you’ve got a good idea what your lady likes. However, that is probably not the case. We’ll help you out and suggest a tote, but what is that exactly? Think of the reusable shopping bags that have gained popularity since plastic has fallen out of favor. This is the basic shape of a tote bag. Tote bags are fairly large, so they’re great for a day out when a clutch or a handbag don’t have the space she needs. Traditionally, totes were made from a heavyweight cloth, often accented by leather on the handles and sometimes on the bottom of the bag. Increasingly, totes have been made from nylon and other synthetics. While these materials work very well, if not properly cared for, they can suffer from sun damage. Practical, stylish, and with enough room for all the essentials, what could be better than a tote bag? Well, we have the answer — Barrington custom tote bags. One of our company taglines is “Valuable gifts made by valuable people.” You can extend that sentiment and give one of these unique bags to the most valuable person in your life. Barrington Tote Bags Here at Barrington, we don’t just want to meet your expectations. We fully intend to exceed them. We apply that same pursuit of perfection throughout the factory we opened back in 2004. By creating a caring environment for our workers and empowering them, you benefit from products that are made with love. You can see from our current range of totes that you’ll be spoiled for choice. Our totes come in all shapes and sizes from the St Anne Petite Handbag to the roomier St Charles Yacht Tote. So, how can you inject a little more personality into a standard-issue bag? You can do this by personalizing it with a monogram. What Is a Monogram? Technically, a monogram is a motif where two or more letters are overlapped to form a single symbol. These days, the letters do not have to touch. Monogram is used interchangeably by most people to describe initials whether they are combined or uncombined. These letters are generally initials, usually the name of a person or a company. If you have glanced at designer bags and wallets that are covered in letters, then you have seen a monogram. 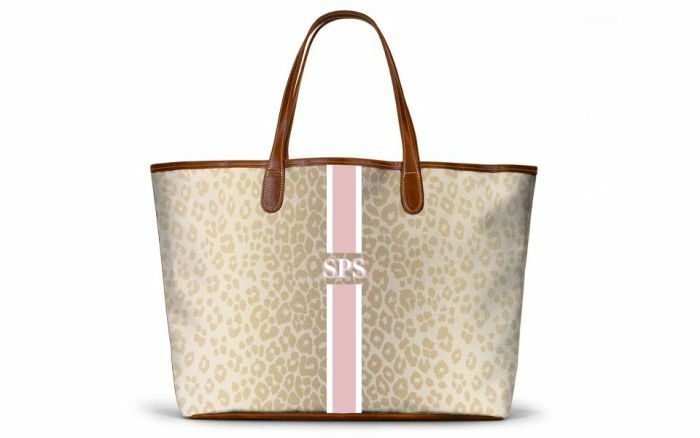 The Perfect, Personalized Gift: A Monogram Tote Bag Our tote bags are made with love from nylon canvas with Florentine leather accents and poly-twill lining. Make them even more special by adding the initials of your love so she can carry her name with pride. We know that upscale fashion is an addictive habit, but there is a drawback to buying these high-end bags. Why would you want your lady to act as a billboard for someone else’s initials when she could carry a completely personalized tote bag with her own monogram instead? You can browse our selection of bags to find a style that is worthy of holding her initials. Our online store makes it easy to build the perfect monogram tote bag. Monogrammed Tote Bags on a Budget If you’re a real bargain hunter, we’ve got something for you that involves a bit of luck. You never know, though, you might hit the jackpot! So what are we talking about? Well, we sell discounted bags each week right here. These bags already have initials but are truly one-of-a-kind. Bookmark this page, and you might end up spotting the perfect bag with your wife’s initials. It’s a long shot, but you might end up with a personalized tote bag for far less than you might imagine. Why Barrington? By choosing to get your gift from Barrington, you are choosing quality. We’ve been helping people find the perfect present for a quarter-century, and we’ll deliver craftsmanship and thoughtful design while also giving you great value. In addition to our website, we’ve got a showroom in Dallas, Texas if you prefer to choose your gift in person. Whichever option you choose, you are sure to find a monogram tote bag she will love. So, we’d turn that question on its head and say, “Why not Barrington?” It’s the obvious choice if you want the ultimate in personalized gifts for a modest investment. What To Do Next Start your shopping experience right here and don’t hesitate to get in touch if you need any advice at all. We’re here to make your life easier and ensure you get the most personalized gifts for your nearest and dearest without needing to take break the bank.